Millions of years ago this area was home to many large trees. After those trees died they were turned to stone. Remnants of those stone trees are plentiful throughout this state park. A fairly easy, mile long hike will take you past many pieces of petrified wood. Operating Seasons and Hours: 7:00-10:00 Summer 8:00-10:00 Winter. Closed Christmas Day and New Years Day. This was the first stop on the fourth day of the Southern Utah Road Trip that my husband and I went on in May of 2010. We left Ruby's Inn at Bryce Canyon and drove an hour east along Highway 12 to Escalante Petrified Forest State Park. We'd planned to stop at Escalante Petrified Forest State Park because it was located along our route for the day. I was hoping to see some petrified wood, but I did want to get my hopes up that I would see anything amazing. I figured even if it was a bust we wouldn't waste much time by stopping there. Before we talk about the petrified wood at this state park we need to pause a moment and talk about my previous experience seeing petrified wood. 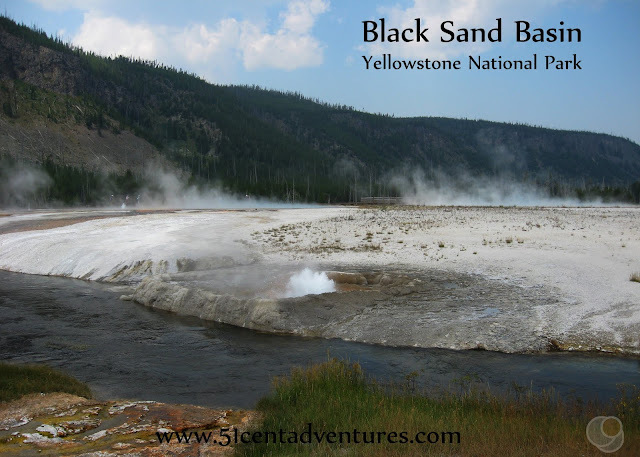 In the summer of 2002 my parents took my siblings and me to Yellowstone National Park. One of the many things we went to see was the Petrified Tree. We drove for almost 2 hours from our campsite at Bridge Bay to the tree. The road was narrow and along the edge of a canyon. When we finally made it to the petrified tree area there were so many cars we couldn't even find a parking spot in the parking lot. We had to park several yards down the road and walk to the parking lot. Then we had to walk up a very crowded sidewalk to the tree. When we finally got to that tree I couldn't believe how underwhelming it was. The tree was barely six feet tall. It was surrounded by a fence and we couldn't get closer than about 10 feet to it. Basically we'd driven all that way to see what amounted to be no more than a boulder on the side of a hill. It was probably one of the biggest vacation disappointments ever. 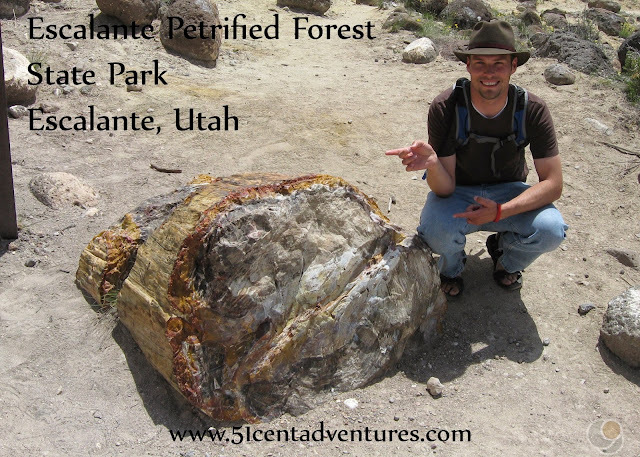 Those memories from visiting the petrified tree in Yellowstone came back to me as my husband and I prepared to go on a hike to see some petrified wood at Escalante Petrified Forest State Park. I wasn't sure if the hike would be worth it or not. First we stepped inside the Visitor's Center. There were some small displays that talked about petrified wood. There were even some peices of rock that tourists had picked up and later returned. It is against the law to collect any rocks from the state park, but some people did it anyway. 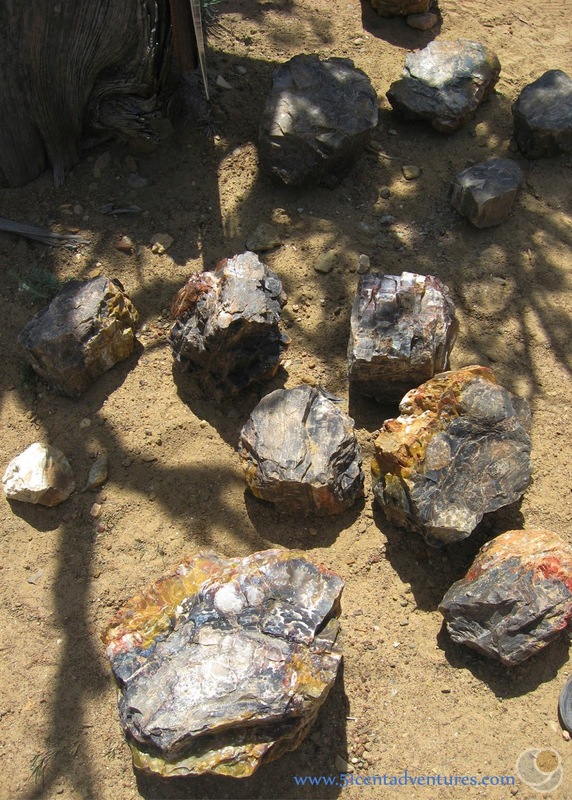 Tradition states that bad luck will come to anyone who removes petrified wood from where it is found. Maybe the people who took the rocks had bad luck and that is what made them decide to return it. After we finished looking at things in the visitor's center we picked up a trail guide and headed outside. 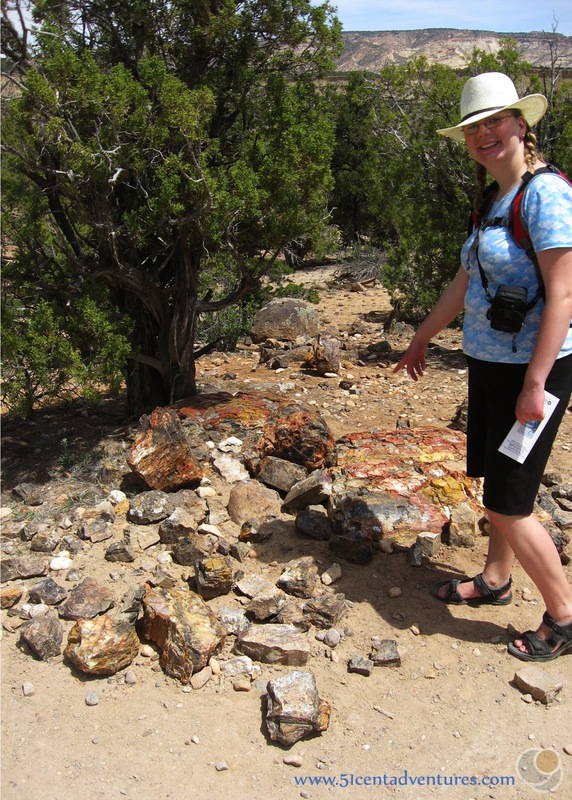 The Petrified Forest Trail is a mile long loop trail that promised to allow us to see a lot of petrified wood. It started out rather steep as we climbed up to the top of a plateau. After that it leveled out. 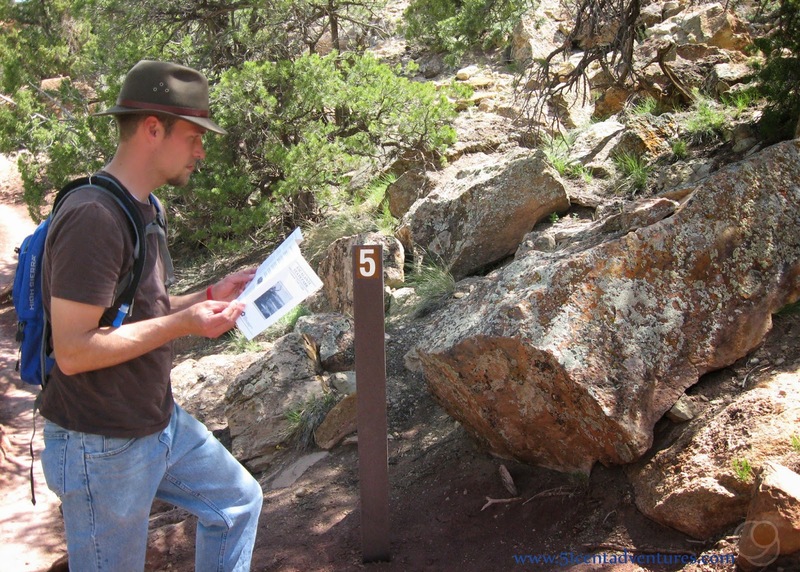 The trail guide had numbered paragraphs that corresponded to numbered markers along the trail. Whenever we came to a marker we could stop and read the paragraph in the guidebook that would tell us about what we were seeing. At first we just kind of ignored the markers, but as we went we found it was interesting to stop and read the facts and other information. 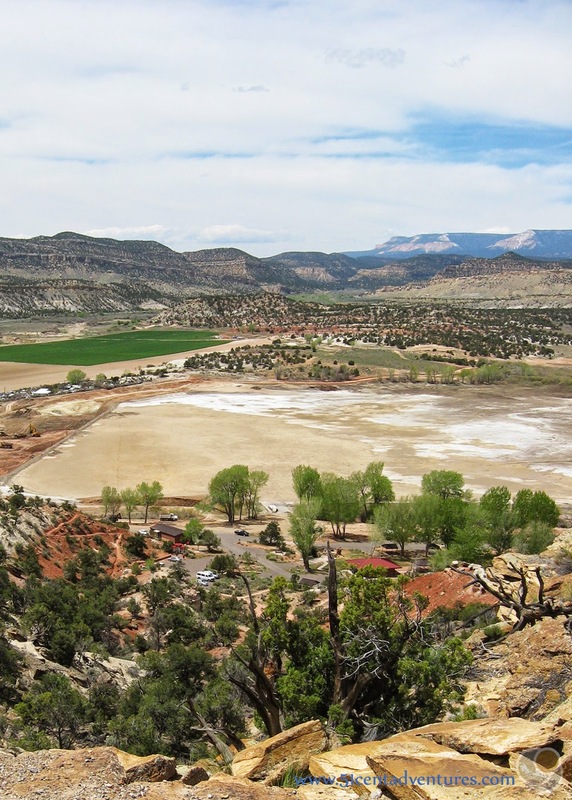 The hike took us to the top of a plateau that overlooked the town of Escalante. 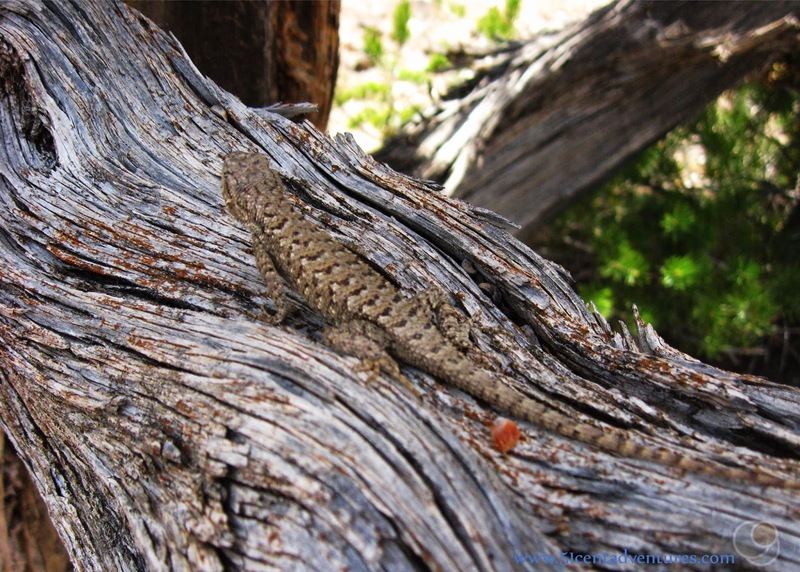 We saw several animals including this lizard. 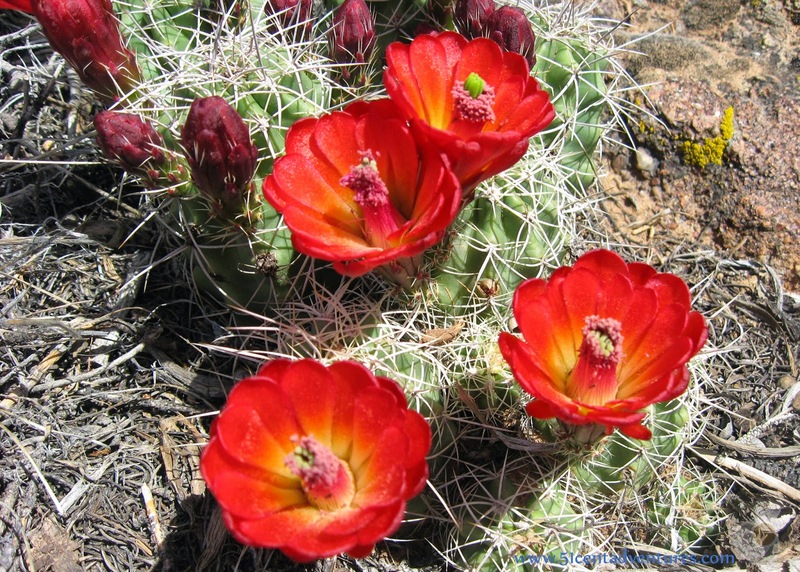 We also saw many flowers including these cactus flowers. We were about half way through the hike, but we hadn't seen much petrified wood yet. The hike had been interesting in and of itself, but I was getting anxious to see some petrified wood. Finally the trail led us to some petrified wood. It was an ancient fallen tree that was now solid rock. I couldn't believe how big it was - or how close we could get to it. Soon we came across even more petrified wood. Again I was surprised by how much there was and how close we could get to it. We passed a lot of petrified wood during the second half of our hike. Most of the wood was in large clusters of rocks like these. I wont bore you by showing you every picture we took of the wood. Instead here is a picture with all the individual pictures put together. I was really impressed by the way that the rings of the ancient trees were still visible. This was definitely a lot better than the petrified tree in Yellowstone. The hike along the top of the plateau gave us a good look at the Escalante Reservoir - or at least where the reservoir would have been. At the time of our visit in 2010 the reservoir was empty. Sand and other sediment had filled the reservoir so crews were working to remove the sand. It has water in it now and is available for water activities like fishing, boating, and swimming. The whole way back down the trail my husband and I talked about how cool it was that we could see all that petrified wood so easily. I told him that we would never take our future kids to the petrified tree in Yellowstone. We'd take them here instead. Directions: The town of Escalante is located along Utah's Highway 12. 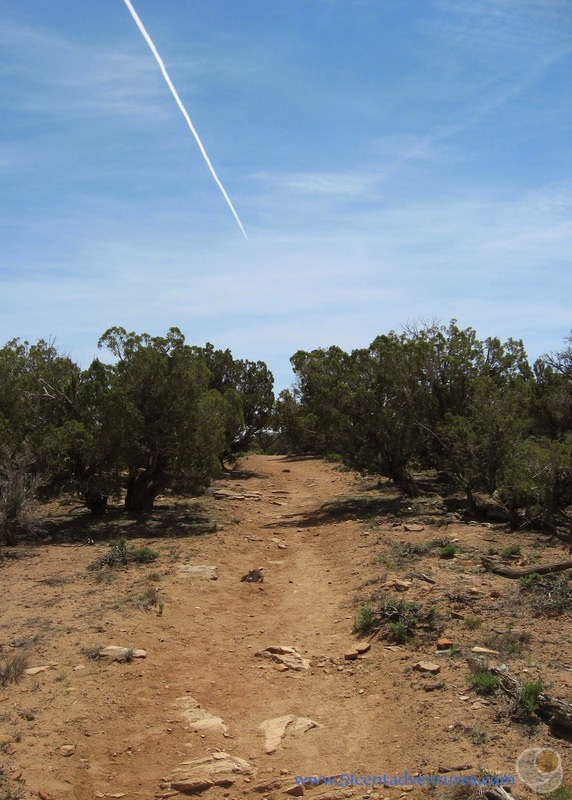 Escalante Petrified Forest State Park is about 2.5 miles to the northwest of the town. Reservoir Road branches off from from Highway 12 and will take you directly to the park. 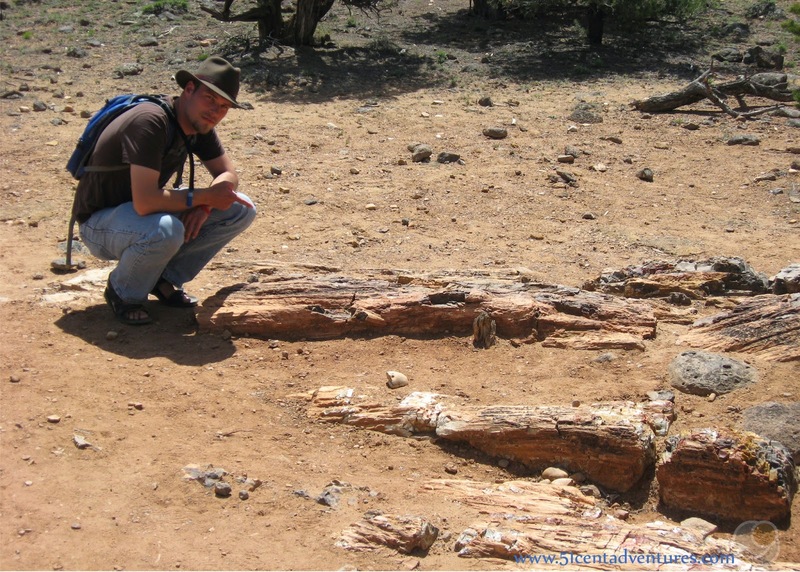 Additional Information: Check out http://geology.com/stories/13/petrified-wood/ for an explanation of how trees become petrified wood. That website also has a list of locations where you can find petrified wood in the United States. 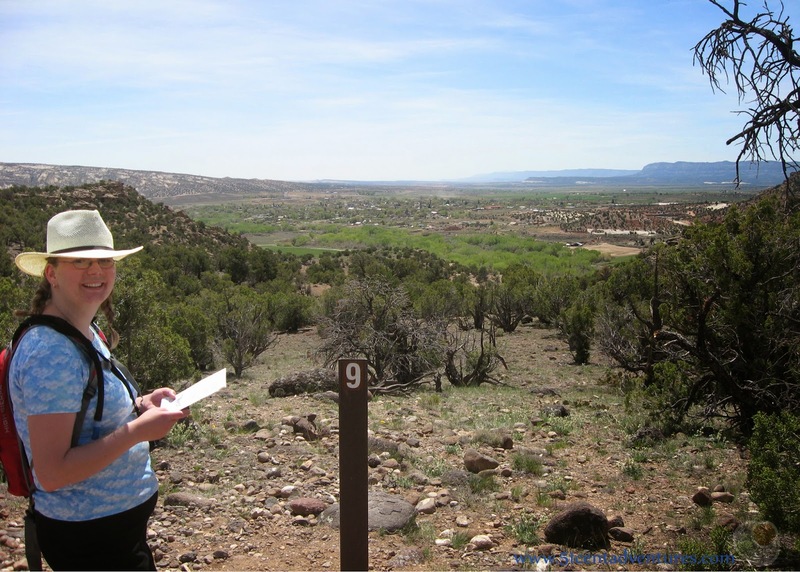 Places nearby: Grand Staircase National Monument is located to the south of Escalante. Most of the roads through this BLM managed National Monument are rough dirt roads. If you have time, and a vehicle that can handle it, you might want to explore the Hole in the Rock Road. It branches off of Highway 12 about 12 miles east of Escalante. Most of the 55 mile road is a dirt road and so my husband and I didn't have time to drive it on this trip. However, read this post from Take my Trip to get a good idea of what you can expect. Driving this road is definitely on my bucket list. We went there this past week and I thought of this post. We added the Trail of Sleeping Rainbows (.75 miles) onto the Petrified Forest Trail which added a ton more sightings of petrified trees. Amazing! 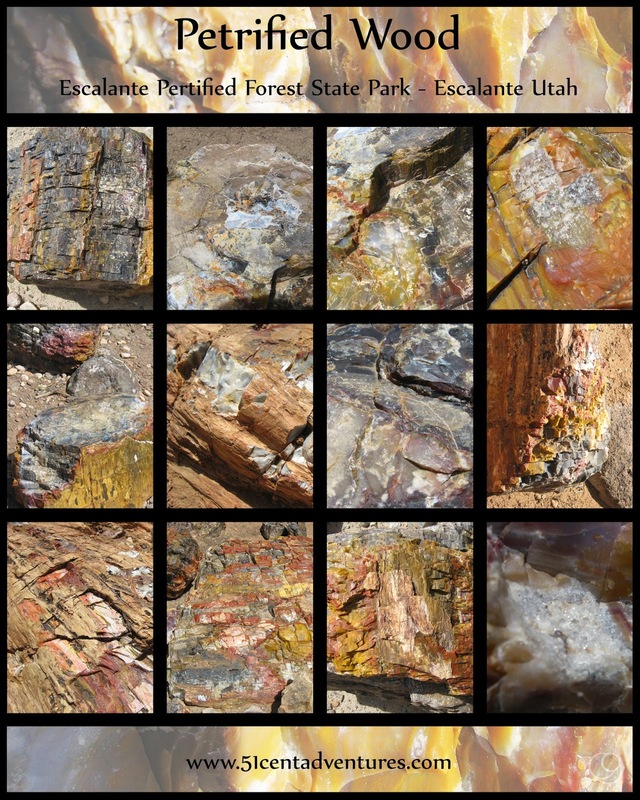 that Escalante Petrified Forest State Park looks awesome! I love history Mark Hutchinson both Utah and natural, and really liked reading about how the list got to be that way.